We are a full-service millwright firm dedicated to helping clients by using the latest in rigging, millwright, and mechanical technology. Cherokee Millwright offers a full suite of services that includes installing, setting, aligning, and leveling various types of machinery and equipment. 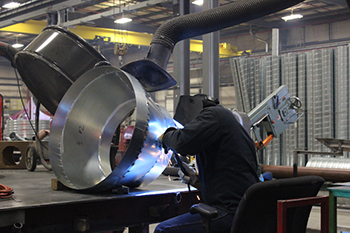 Our team of experienced welders provide extensive fabrication capabilities with the ability to weld stainless, carbon, galvanized, aluminum and copper. Our Robotics Division has the capabilities to install, program, maintain and provide support for the implementation of automatic guided vehicles (AGVs) and self driving vehicles (SDVs) for manufacturing, production warehouses, and other industrial applications. Our HVAC team performs HVAC service, HVAC maintenance, and full-scale HVAC retrofits and are available 24/7/365. We have the expertise to maintain, service, and repair nearly every type of industrial HVAC equipment.